Turn any room into a home theater with this home theater sectional. Track arms offer a sleek look to this piece and also feature cup holders with LED lighting. 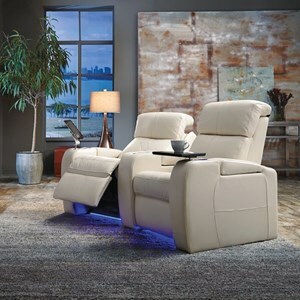 Power reclining and power headrests allow you to get in the ideal position to enjoy every minute of a movie. Add tray tables to this sectional for even more functionality. The Flicks Home Theater Sectional with Power Headrests, LED Cup Holders, and Three Seats by Palliser at Belfort Furniture in the Washington DC, Northern Virginia, Maryland and Fairfax VA area. Product availability may vary. Contact us for the most current availability on this product. 41416-7E RHF Wedge Arm Recliner, Power 1 30" 41" 43"
41416-3E RHF Recliner Power 1 31" 41" 43"
41416-5E LHF Recliner w/RHF Wedge Arm, Power 1 46" 41" 43"
Padding & Ergonomics High resilience seat foam for superior durability and comfort. Blown fibre filled seat backs. 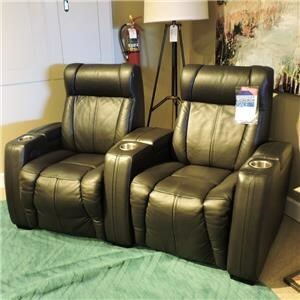 Browse other items in the Flicks collection from Belfort Furniture in the Washington DC, Northern Virginia, Maryland and Fairfax VA area.